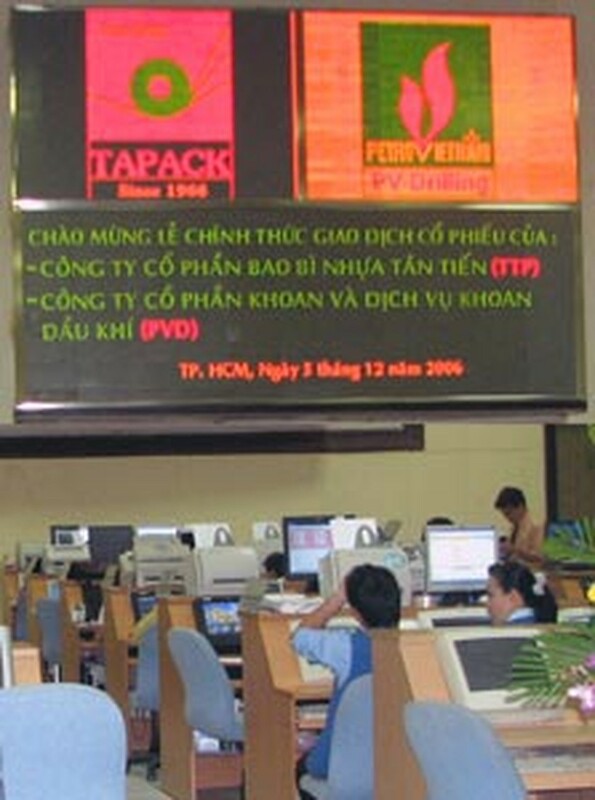 The number of new and established companies trading on Viet Nam’s two stock exchanges has gone up at a dizzying pace in recent days. According to an article in the daily newspaper Sai Gon Giai Phong, the capital stock registered for trading now exceeds US$1 billion and the total market capitalization has surpassed US$7 billion. 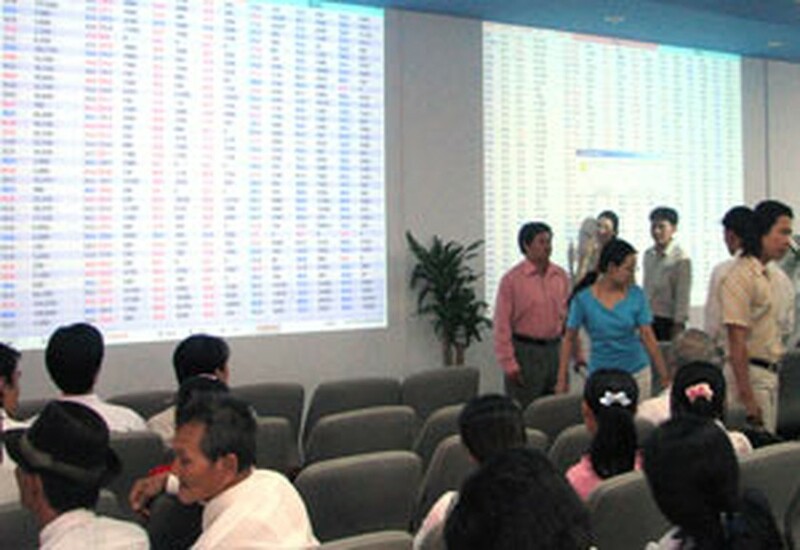 With the arrival on Monday of the Prudential Balance Fund (PRUBF1) and Imexpharm Pharmaceutical (IMP), whose respective starting prices were 1.5 and 10 times their par value, there were 59 companies listed on the Ho Chi Minh City Securities Trading Center (HSTC) with an average stock price of seven times their nominal value. At the Ha Noi Securities Trading Center (HASTC), most of the attention is understandably on the big names, the Asia Commercial Bank (ACB) and Bao Minh Insurance (BMI), but prices are rising across the board and, taken together, the 21 listed stocks are now worth well over five times par. In such a climate the price-to-earnings ratio (PE) is bound to soar and indeed the average now lies at roughly 15. The well-known companies are even higher, from 25 to 32 in the case of Sacombank, Vinamilk, Gemadept, Sacom and Itaco, but their shares are still considered cheap given their profit growth and potential, their market dominance and their overall prestige. One investor watching the action from the floor of BIDV Securities Co. said that if you eliminated the companies where the expectations were highest, the average PE of Viet Nam’s listed stocks would only be about 13, well below other countries. Therefore, in spite of the soaring stock prices, it’s a long way to go before they could be called expensive. Their business foundations are too strong, as are the market’s expectations of these firms. It’s glaringly obvious that domestic and foreign investors see superb value in Vietnamese stocks. After the arrival of PRUBF1 and IMP, on December 5, three companies with combined capital above US$105 million (VND1,686 billion) came onto the scene: PV Drilling (PVD), Tapack (TTP) and But Son Cement (BTS). Their debut brought the national tally of listed firms to 83. With the average trading price 5-7 times higher than the nominal value, the capitalization of Viet Nam’s stock market is now above VND117 trillion (roughly US$7.3 billion). This equals about 12% of the estimated 2006 gross domestic product (GDP) as economists forecast that even if earnings from crude oil, overseas remittance and foreign investment are included, Viet Nam’s GDP this year will be around US$60 billion. The above figures show the extremely impressive growth of Viet Nam’s stock market, one that has exceeded the forecasts and expectations of market managers, who were tipping a more conservative 5% of GDP. It seems almost certain that the party is still in full swing. Just on the morning of December 6, the southern bourse gained two more players, the Rang Dong Light Source and Vacuum Flask Company (Ralaco) and the Tay Ninh Cable Car Tour Company (Catour), and an extra US$35 million-plus in stock value. Now with nearly 80 more companies preparing to list as a matter of urgency, Viet Nam’s stock market capitalization could well reach VND160 trillion, or some US$10 billion, by the end of the 2006 financial year.